There's no better way to get peoples' attention than by calling a national landmark "a completely overblown toilet." That's how the Danish architect Bjarke Ingels put it last year, describing part of the Smithsonian campus at the southern end of the mall. Today, the architect revealed his plan to fix the area. Ingels' comment was a clever way to draw attention to his project, not a legitimate dig. He was talking about the Smithsonian Castle, a red sandstone building at the southern end of the mall that dates back to 1855. Because it's the located midway along DC's tourist highway, it ends up being the natural spot for people who have to pee—thus, an overblown toilet. "There's a great desire from everybody to have it be more than a beautiful bathroom," he continued to Architectural Record. The Castle today. Image: The Smithsonian. The Smithsonian's problems don't end with its national toilet. This stretch of the mall is lesser-frequented than its more famous neighbors, and though it contains a dense and remarkable group of cultural institutions ranging from the Hirshhorn Museum to the National Museum of African Art, it's not always easy for visitors to figure out which one is where. The buildings themselves are aging, and their electrical and heating systems are failing. The spaces where programming is held tend to be cramped, ill-lit, and difficult to find. At a press conference today in DC, Ingels revealed his plan to change that. 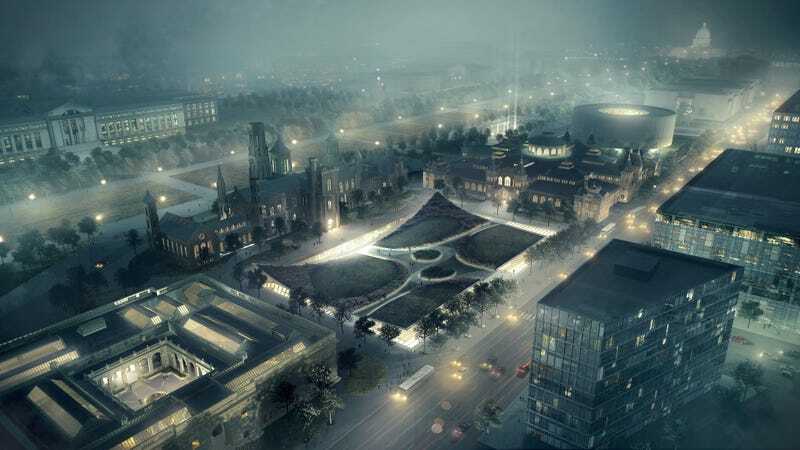 As part of an extensive, year-and-a-half long project to rethink the Smithsonian's campus on the mall, the design team looked at the entire area as a whole and figured out a way to modernize it, not just to improve the conditions of the buildings themselves but to make them easier to find and access for visitors, and create new programming to attract tourists into some of the lesser-known structures. The base-isolation, while innovative and less intrusive than other methods, also affords the opportunity to dig under the Castle, expanding the underground space for amenities and revealing some of the building's basement vaulted ceilings that have long been hidden from view. Another major change coming to the Smithsonian's space will be a newly redesigned garden that currently sits between the Castle and Independence Avenue. Ingels will peel up the garden like a sticker and dig below it, creating entrances to two Smithsonian buildings that are actually located beneath it, the Sackler Gallery and the National Museum of African Art. The currently traditional garden will become an unusual public space, with grassy bowls created by the entrances at its corners as they curve upward to reveal glass doors.